What’s the historical significance of the Reconciliation Dinner? In spring 1865, a freed slave and famed Charleston chef, Nat Fuller, hosted a Reconciliation dinner at his restaurant, the Bachelor’s Retreat. He invited both black and white citizens to sit down together in peace and served an elaborate dinner that celebrated the local environment. The spirit embodied in that historic dinner helped invigorate the desire for social justice in post-Civil War America during a unique culinary experience that still calls to us to gather around a dinner table today. 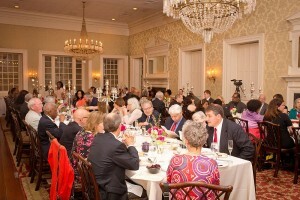 In 2015, Kevin Mitchell, an instructor of the Culinary Institute of Charleston, gathered a consortium of local culinary and social justice groups and recreated the Nat Fuller dinner, replicating both the authentic low country menu and the spirit of peace among key stakeholders and leaders around the table. The inaugural Shreveport Reconciliation dinner in 2016 followed this model, substituting our local foods for the feast. Chef Hardette Harris and a team of local chefs are creating another exciting local menu for the 2018 dinner. Who is hosting and sponsoring this event? Centenary College of Louisiana is sponsoring and hosting the 2018 Shreveport Reconciliation Dinner with additional support from CHRISTUS Health Shreveport-Bossier, The Community Foundation of North Louisiana, First Presbyterian Church of Shreveport, G. Carlton Golden and Rachel Golden, Grace United Methodist Church, Masjid Yaseen Shreveport, and Slow Food North Louisiana. In-kind sponsors include The Levee Restaurant, Sodexo Food Service, and Twin Engine Labs. Planning for the 2018 dinner was coordinated by our Steering Committee – Chris Ciocchetti, Mary Dumars, Jennifer Hill, Kate Pedrotty, Debra Roberson, and Annette Simmons. Our Selection Committee, composed of attendees from the 2016 Shreveport Reconciliation Dinner, reviewed all the nominations and selected participants for the 2018 dinner and discussion. Selection Committee members were Adrienne Critcher, Maxine Sarpy, Clay Walker, and Chrystalyn Whitaker. The 2016 menu featured local, seasonal foods of Northwest Louisiana and can be found here. Stay tuned for news about the 2018 chefs and menu! What will happen at the dinner? Dinner participants will share a meal, hear stories of reconciliation from three featured storytellers, and then share their own stories through open discussion at their tables. We will end the evening with reflections on and suggestions for ways to continue this important conversation. I’m passionate about this issue. How can I participate? There are many ways to get involved with the Reconciliation Dinner. You can volunteer for a future planning committee, become a sponsor for the event, or nominate yourself or someone else to attend.